The Boston Red Sox family mourns the loss of Red Sox Hall of Famer Johnny Pesky, the beloved fixture at Fenway Park who spent 61 years (including the last 44) with the club and passed away Monday at the age of 92. We invite our fans to share your condolences and special memories here in the comments below. Johnny was signed by the Red Sox as an amateur free agent in 1940 and spent 73 years in professional baseball. 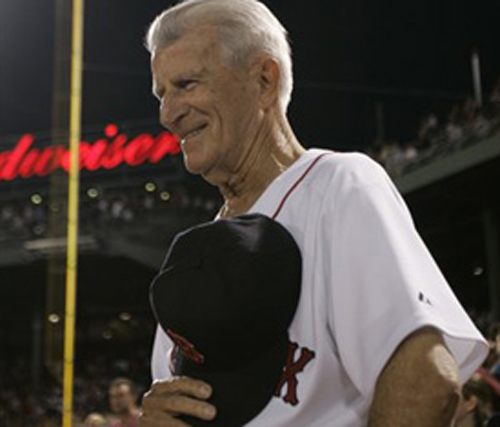 With the Red Sox, he served as a player, coach, manager, broadcaster, instructor and ambassador. The Red Sox will host a public tribute at Fenway Park at a later date. Please feel free to leave your comments below.